Are We There Yet?? 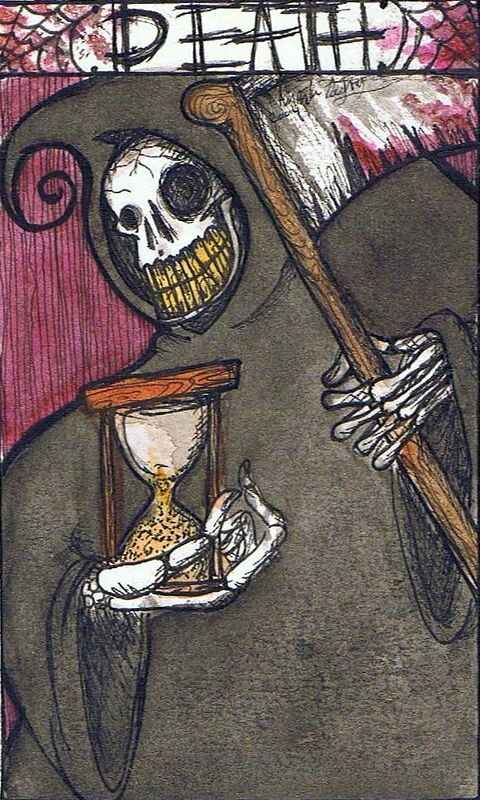 : A "Death"ly Pause! Very nice filler indeed. Love the cobwebs in the corners, she doesn't miss a single detail. That girl is going somewhere with her art. She has an amazing talent! I need her to design something for me for my ghosthunting blog. Amanda does a very fine job. You are lucky to have a filler as you call it. I wish I did. Just saying. did you just apologize for her swearing? Such a mom thing to do! Each generation thinks it invented swear words. I guess I've heard/read them all by now. Incredible piece of art, Linda! Your daughter did that? Wow! She has loads of talent. I know what you mean about the expletives, though. LOL! I have a teenager daughter myself and I often caution her to be more careful with her internet "f bombs" lest a prospective employer finds them one day. Once on a blog (or MySpace or Facebook or Twitter) -- forever in Cyberspace. But, as I'm sure you know, teenagers don't listen to their parents. LOL! I'll leave out my great- grandmotherly dissertation about the use of language. But how many great-grands do you know that wish they'd gone with Songbird to the U2 concert last night??? by the by babe, I think you demoted me.